The Killer B trail is located in the Moab Brands Mountain Biking Area north of Moab, Utah. 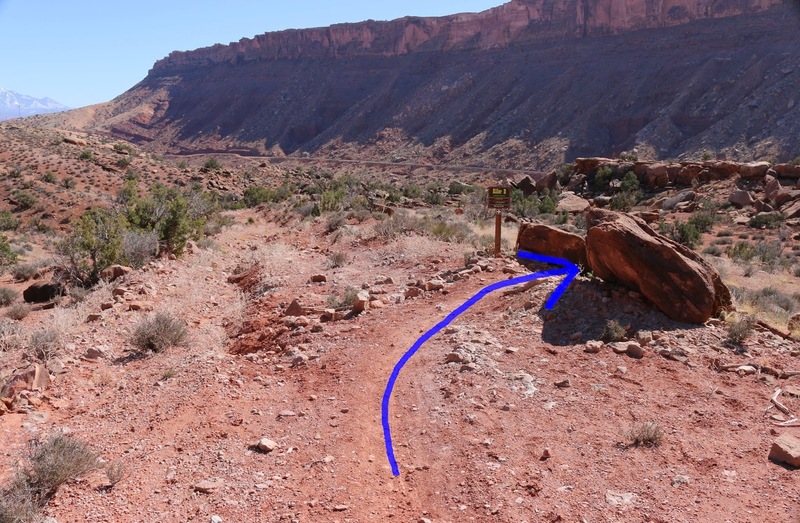 The trail connects the Bar B Loop with the Moab Canyon Biking trail that runs along the old highway bed. In less than one mile the trail makes a drop of over 450 feet. The trail has an average grade of 13% with some sections reaching 30%. All those without superpowers will need to walk portions of the trail. Whether they do it before they crash or after is entirely up to each individual. The Killer B trail starts out at the southernmost point of the Bar B Loop where the Bar B singletrack meets the double track. For the first quarter mile or so the trail follows the same double track that becomes the eastern branch of the Bar B Loop. A trail sign marks the beginning of the singletrack section of the trail. The singletrack continues descending crosses a boulder strewn ridge that is the trails only uphill stretch that lasts all of about 50 feet. As the trail gets steeper a warning sign gives riders something to think about. I made it to right in here somewhere and tried stopping because it was getting too steep for me. As I was stopping I hit a crevice and the back of my bike came up and over me. I was able to pivot on the front tire as I was stepping off the bike and when I came to a stop I was facing uphill with one foot on the ground. It was a good time to start walking. After a long stretch of slickrock the trail flattens out a wee bit and becomes ridable once again. One more sign is placed above the final descent that warns about steep grades, narrow trail and sharp curves. There is a hiker only trail at this point that takes another route off the ridge. The trail past the warning sign didn't seem all that narrow but it is rutted and has some loose rocks on it. The sharp corners mentioned on the warning sign are switchbacks that could be a little hairy if going too fast. The trail comes to an end at the paved path where we racked our brains trying to figure out what the broom signified. With all that the Killer B is a good trail to make a fast exit off of the Bar B Loop. Use good judgement so that search and rescue doesn't have to haul your broken body down the mountain. If you would like to see it for yourself then all you have to do is grab your bike or 'Take a hike'.